Actor and corporate pitchman Ben Stein charges more than $50,000 for a single speech, according to his page at the Keppler Speakers Bureau. Let’s face it: it’s Stein, not Lucia, who is the big draw at the seminars. Stein has made a career out of being a bow-tied smartypants ever since he famously played a dull economics teacher in the movie Ferris Bueller’s Day Off. 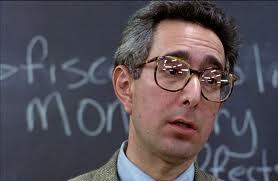 He even sued over his signature look in this lawsuit in which he describes himself as “the most famous economics teacher in the world.” In the public’s mind, Ben Stein is what an economist looks like. The public doesn’t know or care that Stein is a securities lawyer by trade whose credentials as an economist amount to a famous economist for a father and a bachelor’s degree in economics. Never mind that to the folks I know in the finance world think Lucia and his buckets are a joke. Never mind that anyone at Goldman Sachs who starts blabbing about buckets of money will be shot at dawn. I doubt that Stein truly believes that the “genius” of Ray Lucia is his bucket strategy. His genius such as it is lies in his salesmanship. Lucia understands that regular people don’t want to read financial reports and SEC filings. They want to see a man who plays an economist on TV. They want to hear jokes get some free advice about what to do with their retirement nest eggs. They want a show. So they come for a show and they leave with a new money manager, Lucia’s son, Ray Jr. It will take a while before these unsuspecting investors realize that Lucia Jr. has drilled holes in their buckets with his company’s high fees and questionable investments such as non-tradeable REITs that earn Lucia huge commissions. Stein provides his pal Lucia an additional, equally valuable service — repeatedly dropping Lucia’s name in his business columns in The New York Times and elsewhere. Stein’s shilling got him canned from the Times, so now he name drops Lucia in his American Spectator diary. Stein will say almost anything if you pay him. He served as an expert witness for lawyers at Milberg Weiss until the firm went down under federal indictment for bribery and fraud. He has pitched Comcast, eye drops, cars, office equipment. So it’s no surprise that Stein praises Lucia as a “guru” or a “genius” in the same breath as Warren Buffet. But this is a particularly insidious form of advertising. If you repeat something enough times, goes the old saw, it becomes truth. Especially when you can repeat it in The New York Times. I happened to be sitting at Morton’s restaurant in Beverly Hills a few days ago with Mr. [Phil] DeMuth and with another financial adviser for whom I have high esteem, Raymond J. Lucia (for whom – full disclosure – I am about to give a speech or two urging people to save for retirement). Ray and Phil were right. And they will keep being right. I was recently on a panel with the stock guru Ray Lucia, who offered overwhelming data about how impossible it was to pick stocks, trade in and out of them and fare as well as the market. His data was terrifying. I checked with my investment gurus, Phil DeMuth, Raymond J. Lucia and Kevin Hanley. None of us could see how Mr. Madoff could do what his friends said he could do. I am to give a speech at a huge gathering hosted by my pal Ray Lucia. It is about investing. He has an immense crowd of well over 1,000 people today and my job is not really to sell them anything, but to give them a general overview of the economy. ~The American Spectator, May 2010. Now, to pack and prepare to go see my pal Ray Lucia. Ray is simply the best wealth manager I know of. He knows more about personal finance than any other person I have ever met. His advice — lots of liquidity and very wide diversification — is so sensible it has saved me from suicide many a night. This guy is a lifesaver where managing money is concerned. We are colleagues, so I am not disinterested, but even before we were colleagues, I was learning from him and being guided by him. ~The American Spectator, June 1, 2010. I have done the best I can, with the help of some true geniuses of finance like Phil DeMuth, Chris DeMuth, Ray Lucia, Anil Vazirani, J.W. Roth and, supreme above all of them, John Bogle and Warren Buffett, to invest wisely. I’m posting this because this news might well be overshadowed by a well-timed leak to The Wall Street Journal that Facebook is hoping for a $100 billion initial public offering later this year. The US is announcing the death of Anwar al-Awlaki, a U.S. citizen who moved to Yemen where he waged jihad against his former homeland. Assuming this is true — and not a repeat of what happened in 2009 when Awlaki was falsely reported as dead — it’s a major blow against one of al Qaida’s superstars. What made Awlaki so dangerous wasn’t his so-called operational abilities, as the U.S. is now claiming, although no one is actually bothering to ask what that means. Awlaki was an intellectual, not a fighter. What made Awlaki so dangerous was his somewhat unique ability to inspire disaffected Muslims in the West to take up arms in the cause of jihad. Awlaki may have rejected the West, but he knew how it worked. He spent many years here in San Diego and spoke both Arabic and English beautifully. Recordings of his sermons are very popular. He also knew how to use the Internet to reach people. I don’t think it’s a coincidence that U.S. counterterrorism officials started linking him to terrorism in the very same month that Awlaki started his now-defunct jihadist website. I won’t be shedding any tears for a man who plotted to kill Americans and praised the Fort Hood shooter Nidal Hasan as a “hero.” But Awlaki wasn’t Osama bin Laden. He wasn’t an Iraqi insurgent or a Taliban trying to kill U.S. troops. Awlaki a U.S. citizen. He knew his death would point out the hypocrisy of a country with a constitution that guarantees its citizens due process of law and then goes out and assassinates them in Yemen with a drone strike. He knew we would succumb to our fears. Like it or not, he was one of our own.